Fall is here and there’s a chill in the air! No one wants a cold house so this is a good time to make sure your heat is working. Most properties in Southern New Jersey are equipped with furnaces but there are a few homeowners that value the heat provided by boilers. Lucky for you, we specialize in boiler maintenance, installation, and repairs. Boilers are special-purpose heating units. While furnaces carry heat in warm air, boiler systems distribute the heat in hot water. Boilers give up heat as it passes through radiators or other devi ces throughout the house. The cooler water then returns to the boiler to be reheated. 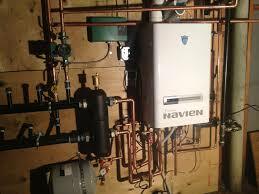 These hot water systems are often called hydronic systems. Residential boilers generally use natural gas, propane, or heating oil for fuel. Like many other appliances in your home, your boiler requires maintenance before started for the season. We recommend hiring a professional to ensure that no step is forgotten and all aspects of your boiler are functioning efficiently and safely. If needed see how to have a boiler replaced. Check condition of baseboard, radiators, or any vents. Learn more about your boiler and our services by calling 856-430-8452 or you can simply fill out the contact form. Do not let a cold winter get to you this year with expert help from the best guys in the business.